The Recharge electronic cigarette kit by NJOY is a great place to start your vaping journey. With the simple Press-Fit™ Technology you can easily switch your refill cartridges, allowing you to find the flavor and strength that work best for you. The all-new NJOY Recharge is a rechargeable version of the extremely popular NJOY King Electronic Cigarette series. This brand-new, cutting-edge rechargeable e-cigarette system offers strengths in higher-than-usual nicotine levels for those looking for a stronger nicotine hit. The NJOY Recharge combines the convenience of carrying a smaller-style e-cigarette in a smart plastic carry case, with the great-tasting flavor of NJOY's famed tobacco vapor. The plastic pack included in our starter kit holds up to five (5) flavor chambers refills, plus two rechargeable batteries and a USB charger. 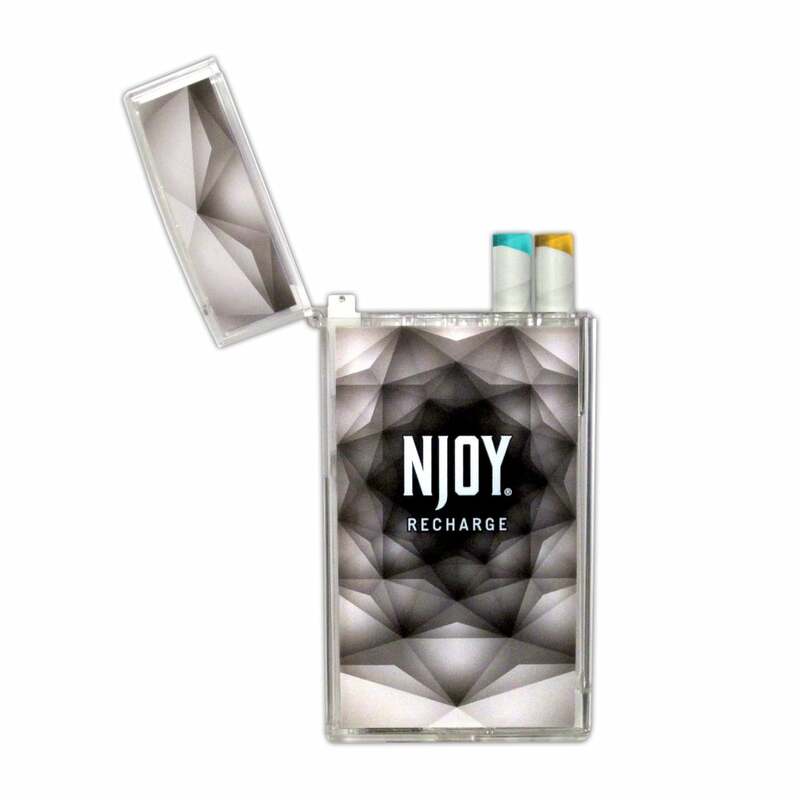 Where NJOY used to only offer tobacco and menthol flavors, the NJOY Recharge brings with it a number of 'flavor chambers' which can be used to refill the e-cig with less traditional tastes. These cartridge refills come in the following flavors: Bold Tobacco, Gold Tobacco, Menthol, Vanilla Bean & Pomegranate. I prefer the rechargeable E-cigarette --When I would buy the disposable E-Cigarette the battery never lasted for the 300 puffs that I would have many that lasted only 100 puffs and it would drive me crazy there would be nothing I could do about it except return to the company. The rechargeable I would just plug in and recharge and they would last at least 1 month or longer. I am very satisfied with the products I have ordered. The NJOY e cigarettes tastes just like real ones. I cannot figure this out at all. How do you recharge it? Love the case that comes with it. Smoothest draw of all the e-cigs ouit there.Like the size, looks like a triditional "real" cig. My one complaint is that it has to be recharged so often.But the price makes up for that. Snap-on cartridge is a plus. I would like to see a red tip rather than green. All in all a great product. some of them seem to have better draw than others. I Really like the thin ciggerette feel and it draws great. U will misplace before it wears out. Super product. Mine got wet a few times, not soaked, laid in sun & 10 min. working again. Excellent value. Batteries and cartridges don't last as long as some of the others, but the cost more than compensates. This is my favorite brand and had not used this for a while, but I decided to try it again and i'm glad to see that it has it's own charger and flavor packs...Good product! I like the container very much, the idea of being able to carry your cigarettes, refills, and charger all in one place, is very convenient. I plan to purchase another one to keep in my car as a spare. I just wish that you also would offer just the charger by its self, you can never to many chargers.